While the Solar Eclipse of 2017 was something I’ve known about since I was a kid, the Annular Eclipse of 2012 was one that caught me by surprise. But this was definitely a good opening act for the main show about to happen in five years. I just happened to be on the correct website that showed me the path of an Annular eclipse that just so HAPPENED to be pretty close to where I live. I spotted that it would not only go over parts of Northern California, but also over Nevada, Southern Utah, and Northern Arizona. 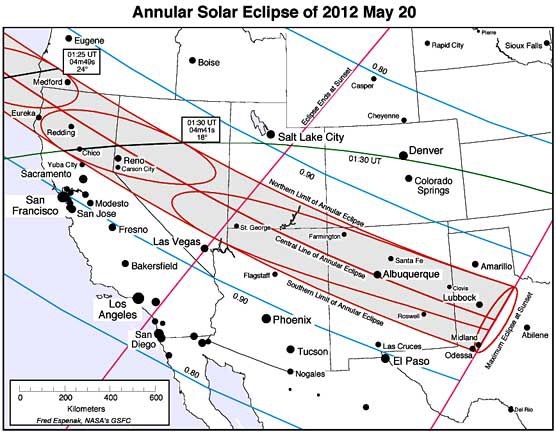 Plus, it was only going to be visible for people living west of Texas. Of course, I had to tell everyone I knew to convince people to take the drive to see it. 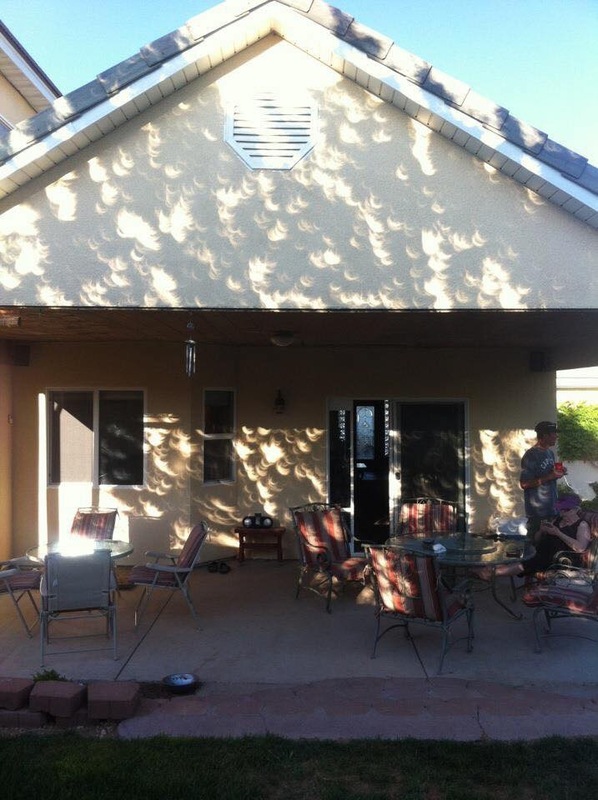 Thankfully, it was decided that it would be a trip consisting of just my parents and living siblings, as the five of us would use my brother’s RV and drive to Southwest Utah, where the path of the eclipse was relatively the closest to the L.A. area. Plus, my father knew a family friend he used to work with that happened to live in Cedar City, which was fairly close to the “sweet spot” inside the path. This being an Annular Eclipse, that meant that there would be no circumstance where what was left of the sun’s disc would be safe to view. In the days leading up to it, my family made it very clear to me that they wanted the right tools to be able to see it safely. I knew that simply using layers of sunglasses would not be enough protection. 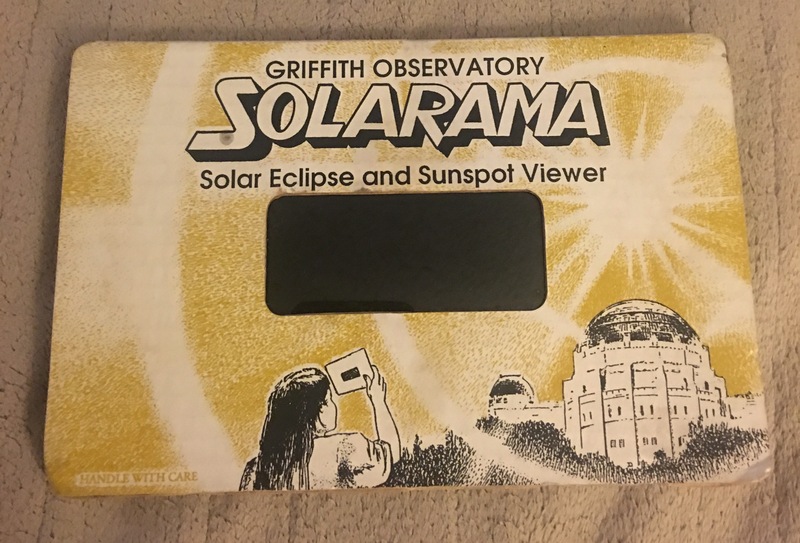 I saw online that the Griffith Observatory would be selling special eclipse viewers for such the occasion just before we were to leave for Utah. When I called them about it, they told me they are on a first come, first serve basis, and that they weren’t sure when they’d sell out. 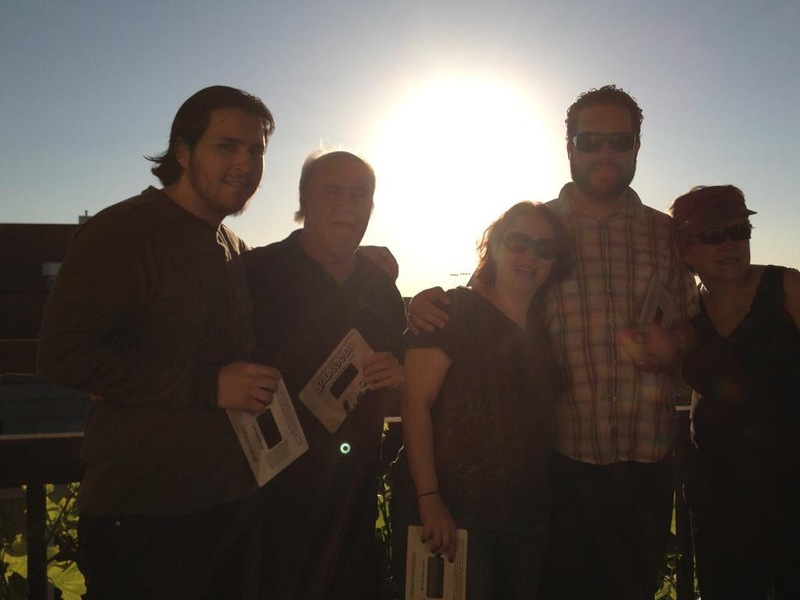 Despite the eclipse being on a Sunday, The eclipse viewers at Griffith Observatory were sold out by Friday night, just after I got them. 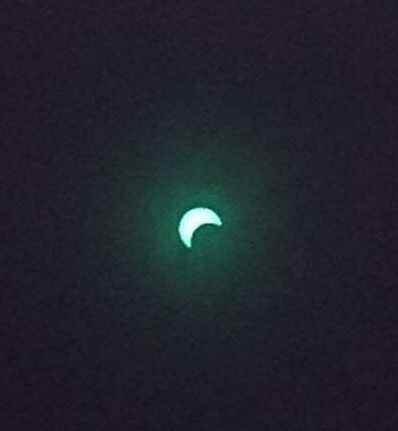 From Cedar City, The eclipse began at 6:22 pm. By then, people back home had already seen their “crescent sun” and were posting their images on social media. Since I knew I was going to see the sun and moon align into a “ring of fire” I was ready to one-up the posts from people back home. I did not have the equipment that I have now. While yes, I did get the proper viewers for the eclipse, I still had nothing for my telescope, as I had not thought about ordering solar filters to attach to the end of my tube. All I could do was hold my viewer that I bought from Griffith Observatory and try to align my iPhone to take a picture. 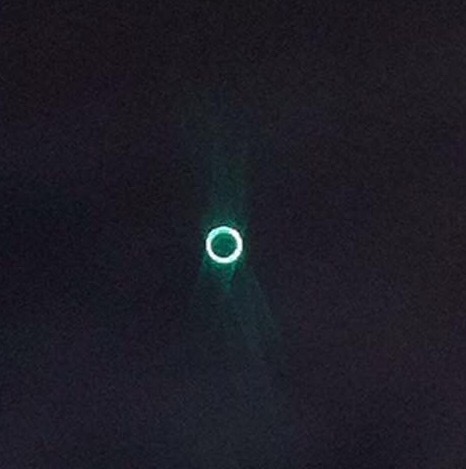 Sometimes I was able to get a “lucky one” as we call them in astronomy, and immediately post the picture on Facebook. Thankfully, people loved the posts, and asked me to keep them coming. For those that do not understand how that works, the following picture explains it. 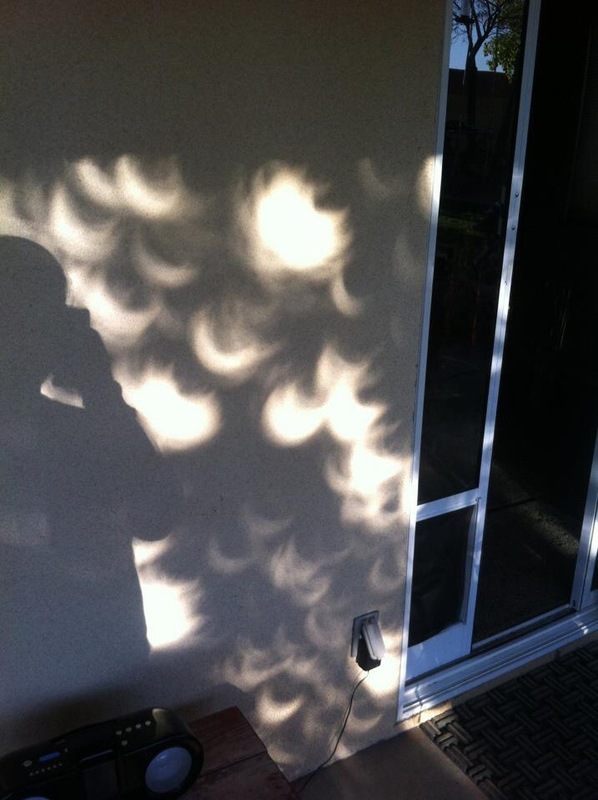 As the moon covered more of the sun, the crescents being projected on the house grew slimmer. One thing of note, is that even though the moon was covering more and more of the sun’s disc, just by naked eye observation alone, you wouldn’t be able to tell. What was left of the sun was still so bright, it still looked like the whole sun was there! On the other hand, you could tell the sun was giving off less heat, it felt cooler, and by looking at the house, or the red cliffs to the east opposite the sun, you could tell they were a lot dimmer than usual! Finally, at 7:30, the anticipated moment arrived! The eclipse was finally reaching its climax when the disc of the moon was completely over the disc of the sun. Once the moon completely crossed over, and the remaining sun’s disc became a ring, we could hear the cheering roar of Cedar City’s 30,000 residents! The entire town cheered in excitement over what they were seeing! The host family immediately played “Ring of Fire” by Johnny Cash over their speakers, a very fitting song! 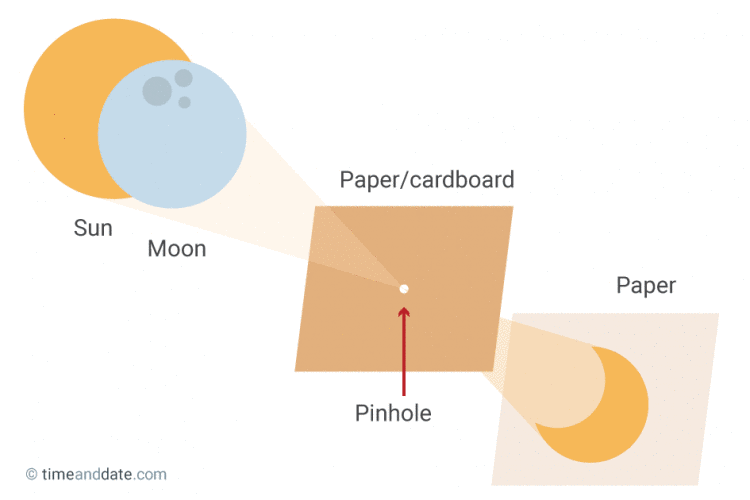 As for the pinhole projections, usually they disappear if it’s a total eclipse (as there’s no more of the sun’s image visible). 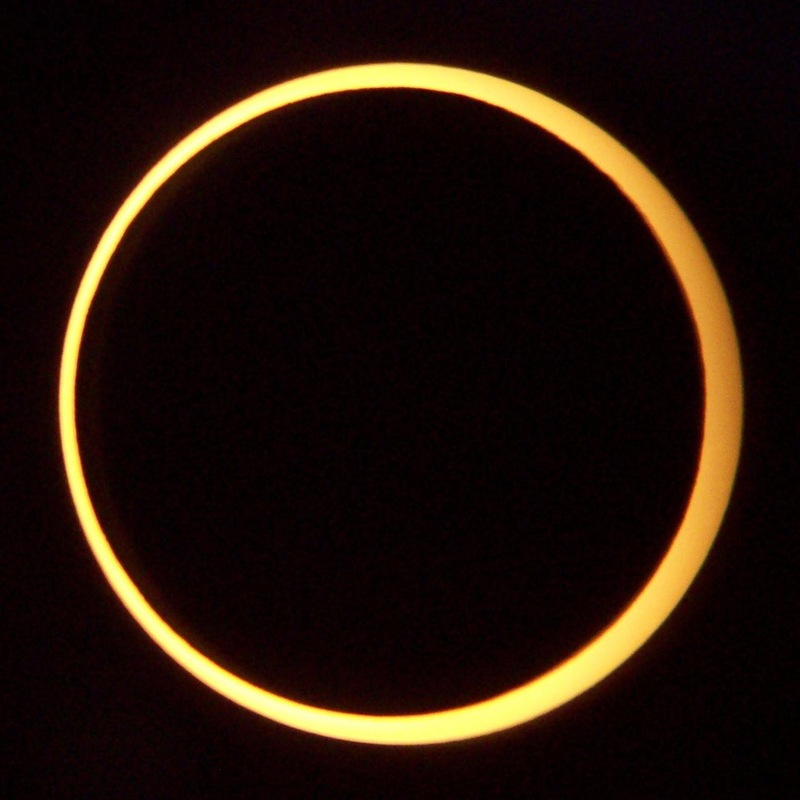 But during an Annular Eclipse, you see something else that’s almost equally incredible! While the moon and sun were aligned to form the Annular Eclipse, the entire backdrop of the house was littered with little rings! Once again, even though it was aligned in that way, through the naked eye, the sun was still too bright to be able to tell there was an eclipse going on! You can easily tell by the above picture that the eclipsed sun is still too bright for the naked eye, however, the lens flare is actually an image of the eclipsed sun! The Annular Solar Eclipse of May 20, 2012 was a great experience for those who were either lucky enough to be inside the path, or for people like me who traveled to see it. What is the only tough part for talking about the 2017 eclipse? Convincing people that the 2017 eclipse will not only top the 2012 show, but also couldn’t be any more different!